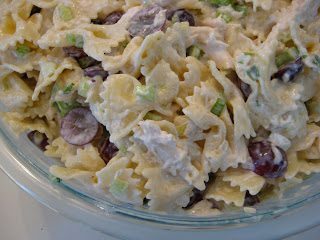 I’ve been making this chicken pasta salad forever, and to be honest, I almost forgot about it until an old friend mentioned that she makes it all the time, and that it still gets rave reviews. Note: because there is mayonnaise in it, it needs to be kept cold in a cooler. Mix all ingredients together. Allow plenty of time for the salad to be well chilled and for the flavors to blend. Adjust salt if needed.